Classical Music Sells Millions Of Records!!! Times are tough in the recorded music business with sales revenues declining significantly and regularly this century. Times are particularly tough in the classical music part of that business with its decline outpacing the market at large. John Culshaw and Solti (in Plimsoll’s) in the Studio working on The Ring. We’ve been reading Norman Lebrecht’s marvellously pacey race through the history of classical recording in his book “Maestro’s, Masterpieces and Madness” and would recommend it to all people interested in the story of the record business. 1. Wagner Ring – Solti (Decca) 1958 – 1965 18 million. Produced by Decca legend, John Culshaw, this is “a better record than Sgt Pepper” according to its fans. Here is an excerpt from a BBC documentary about the making of the records, starring Solti’s strange jerky style conducting and Culshaw’s calm comfortings. 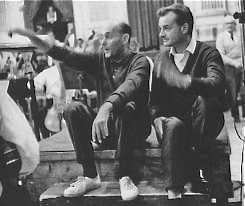 Style fact: Decca engineers (and Solti) wore white plimsolls when in the studio to avoid causing background noise. This entry was posted in 1965 and tagged 1965, caruso, decca, john culshaw, norman lebrecht, solti, wagner by Nipper. Bookmark the permalink. Sounds quite a neat book; will certainly check it out!